BayLegal’s Youth Justice Project provides disadvantaged youth and adolescents with holistic supports, services, and legal representation and by providing early identification and intervention through a collaborative partnership with community-based religious leaders. Foster Care – A Contra Costa study showed that 35% of foster children are arrested at some point while in foster care. For that reason BayLegal provides expertise in foster care benefits programs and partners with the Youth Law Center and the Public Interest Law Project to provide trainings in foster care benefits to attorney and advocate organizations. BayLegal is also on the Foster Care Benefits Taskforce, a state-wide taskforce that tackles systemic barriers to benefits for foster care youth. Health Access – Assist youth by removing barriers to healthcare coverage due to wrongful coverage suspension, termination, language barriers and more. Supplemental Security Income (SSI) – Prepare and submit SSI applications and prepare appeals for denied applications. Education – Advocate for youth who are disenrolled from their local school when they are placed in juvenile hall, inappropriately placed in self-study programs, in need of an initial special education assessment, or lacking an appropriate and current Individualized Education Program (IEP). Housing – File habitability claims with local housing agencies to remedy substandard housing conditions such as rodent or pest infestations, mold and other health hazards and prevent imminent homelessness. Homeless Youth Services – Provide weekly, ongoing clinic at Oakland’s DreamCatcher Emergency Youth Shelter to assist youth with legal issues and help stabilize their housing situation. 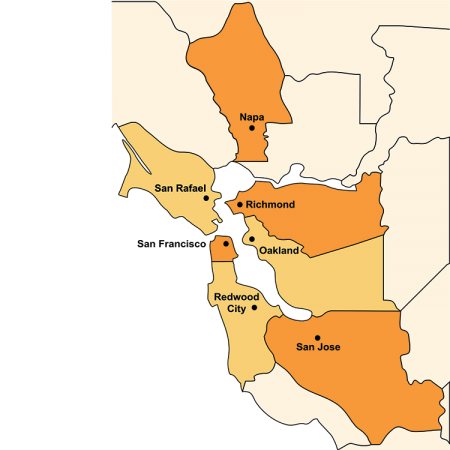 Alameda Collaborative Courts – BayLegal acts as the Civil Advocacy Coordinator for the Alameda County Juvenile Collaborative Court. As such, BayLegal works with detained youths and their families to assess and address their civil legal needs (unrelated to the juvenile justice proceedings) in key areas including accessing health insurance or appropriate mental health treatment, unmet educational needs, low income and housing instability. For more information see NCYL’s publication Improving Outcomes for Youth in the Juvenile Justice System. Youth Justice Project cases have an outstanding 95% success rate. These youth who successfully receive housing, medical, education support and more through advocacy by BayLegal are significantly less likely to be repeat offenders. With BayLegal’s assistance, youth are appropriately supported by community resources such as proper educational placement, access to mental health counseling, economic stability through government benefits programs – and therefore no longer needs the continued supervision of the juvenile delinquency system.